I looked for a carpet cleaner online and read Kevin’s website. There he explained the technology he uses and gives comparisons to other techniques. The reviews praised him for doing all the work himself meticulously. Kevin’s website has a place to enter the rooms and sizes for an estimate so I did not need to call. I included Key along with two big name companies for estimates. One company did not respond and the other called back and grilled me regarding the type of carpets, pets, etc, that I have, made me feel bad, and quoted me DOUBLE what Kevin quoted. Kevin simply called back with the estimated price based on my measurements and we made an appointment. Kevin arrived punctually, reviewed the areas and gave me the final quote before starting the work. He proceeded to work for over 3 hours using a variety of cleaners and equipment. This is the fourth home I owned in 4 different cities and I am very familiar with the truck-mounted wand cleaners and even the chemical cleaner (to which I had an allergic reaction). No one has EVER taken that much time treating, cleaning and even raking (?) the rug. My carpets were overdue for cleaning and the results are equivalent to having them new again. The colors are vibrant and the pile has reappeared. I highly recommend Kevin of Key Carpet Cleaning as your carpet guy. I hired Key Carpet Cleaning in November to clean my carpets after discovering them through a referral. Key Carpet Cleaning did an incredible job all around. They arrived promply and inspected the carpet with me. They vacuumed. They made the concerted effort to test their cleaning & pretreatment product on my carpet before applying it. I had 6 rooms of dirty carpet to clean and they really did a nice and thorough job of completing the carpet cleaning. The owner was there almost 4 hours completing the work himself. I was totally impressed with his work ethic and his equipment. 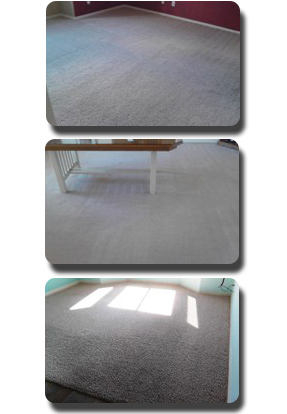 I would recommend Key Carpet Cleaning to any one in need of carpet cleaning. 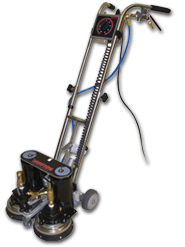 Key Carpet Cleaning uses the Rotovac DHX rotary jet extraction power wand for superior restorative carpet & tile cleaning results. I ensure that Key Carpet Cleaning has the most advanced cleaning equipment available for carpet cleaning services in Prescott, and carpet cleaning services in Prescott Valley. Two counter rotating, dome shaped cleaning heads. Both cleaning heads are equipped with three, triangularly positioned, spray jets partnered each to a vacuum slot. Incorporates a powerful, rotary jet extraction, deep cleaning dynamic of encased heat in the cleaning zone, agitation and multiple flushing actions, with vacuum extraction. Each cleaning head is powered by a high torque gear motor generating up to 1500 carpet cleaning passes per minute. Agitation, simultaneous with vacuum extraction, provides both deep cleaning and rapid drying. Equipped with variable cleaning head speed and pile height adjustments enabling the Key Carpet Cleaning service technician to adjust the DHX for optimal dirt lifting and vacuum extraction capabilities. 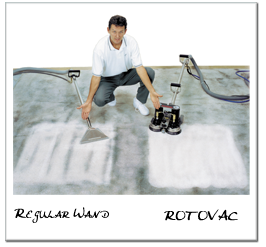 The Rotovac DHX Power Wand versus the Manual Scrub Wand. The manual scrub wand is a tool used extensively by both Prescott carpet cleaners, and Prescott Valley carpet cleaners. When cleaning more heavily soiled carpet the manual scrub wand becomes labor intensive and highly unreliable. The cleaning result for the manual scrub wand is entirely dependant upon the technique, strength, stamina and effort of the Prescott carpet cleaning services technician or Prescott Valley carpet cleaning services technician utilizing the manual scrub wand. When cleaning with a manual scrub wand the cleaning results depend on how much elbow grease the technician is willing or able to put into their work. The Rotovac DHX is an electric power tool that does most of the labor intensive cleaning and all the scrubbing work for the technician. Comparing the Rotovac to a manual scrub wand is like comparing a skill saw to a hand saw. The Rotovac DHX is more efficient and effective to use than a manual scrub wand. The Rotovac DHX employs a rotary jet extraction, deep cleaning process of contained heat within the cleaning zone, agitation and multiple flushing actions, with vacuum extraction. The Rotovac DHX makes more cleaning passes, up to 1500 per minute, than is possible with a manual scrub wand. In addition, the cleaning passes scrub from all directions rather than just scrubbing back and forth. The Rotovac DHX’s counter-rotating cleaning heads allow it to easlily glide back and forth over the carpet with an operation much like an upright vacuum cleaner. The Rotovac DHX, rotary jet extraction, power wand produces far more efficient, far more effective, far superior cleaning results! Key Carpet Cleaning’s pricing is consistent, straight forward, and competitive for carpet cleaning services in Prescott, and carpet cleaning services in Prescott Valley. We offer free estimates with no hidden fees and we stand behind both our estimates and our work. We offer the highest quality of carpet cleaning services in Prescott, and the highest quality of carpet cleaning services in Prescott Valley. Key Carpet Cleaning ensures customers receive reliable services and the highest quality of carpet cleaning in Prescott, and the highest quality of carpet cleaning in Prescott Valley. Thank you each and every time for your decision to select Key Carpet Cleaning.